For a long while now I have felt that "For My Little Monster" doesn't really fit anymore, I feel like I have out grown the name. 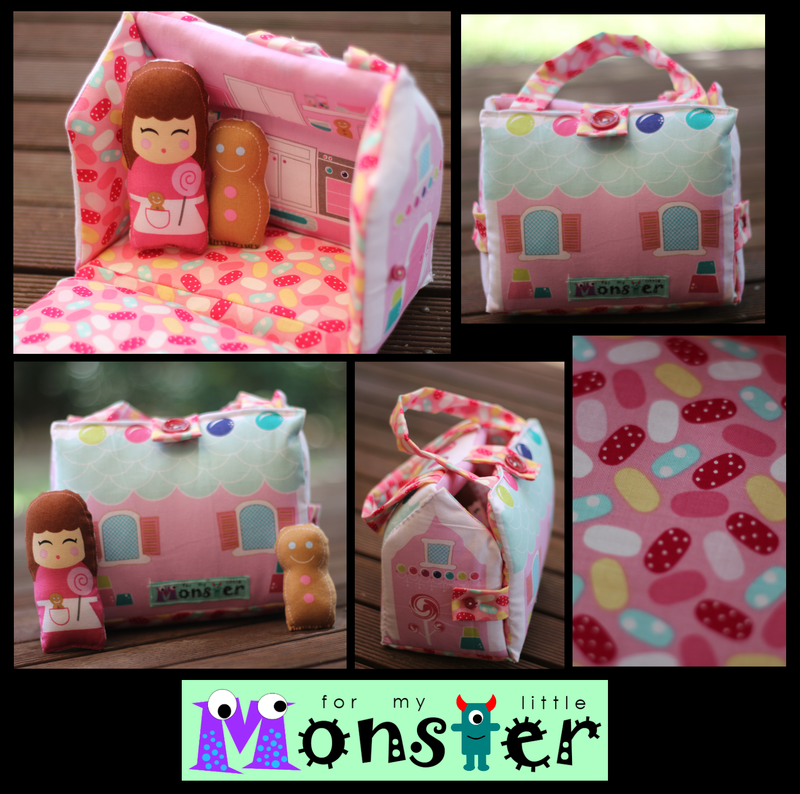 I chose the name "For My Little Monster" around 5 years ago, and at the time I was sewing mainly toys and selling these toys to my customers, so at the time that that name suited me. Bottom image: my playhouse (made using a self drafted pattern). Now however, I don't really sew toys and I don't sell any sewn goods to customers either. I only really sew for my family and friends and the majority of what I sew these days are handbags. What I actually do now is design handbags and I write sewing patterns for these handbags (which I sell here), this has only added to the feeling that my old name doesn't really fit anymore, as the majority of my patterns are aimed at adults not children. So, from today, the name of my pattern business and blog will be changing to "Emkie Designs". You will still be able to find all my patterns for purchase here, and all future patterns will be released under my new name...Emkie Designs! Why did I pick the name Emkie Designs (pronounced: Em-Key)? I came up with a number of names that were great, but most of them made me feel like they pigeon holed me, and I wanted a name I could grow and develop with! But "Why Emkie?" I hear you say!?! I hope you like what you find here...why don't you have a look at my new About Page to find out more about me and what you will find on my blog from here on out? You can find my patterns in my shops here: Etsy, and Craftsy. I also have a free bag pattern, The Reunion Clutch - so feel free to download it from Craftsy so you can check out my pattern writing style! If you want stay in contact with me, hear all my news (including, but not limited to...information about upcoming pattern releases, other news, discount codes, tutorial links and information about sew-alongs and competitions) please sign up to my newsletter.